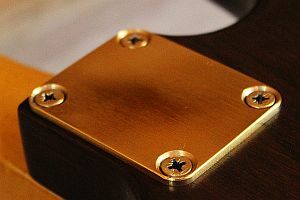 Wudtone Neck Plate, Screws available with optional : satin, high lustre finish, gold plate, microtilt access in our online shop here. A strong joint with compression between the body and neck of the guitar matters for tone and confidence. Somewhere in the switchover from imperial to metric ( probably alongside some cost cutting measures) the good stuff, as used on early strats, has been replaced with poorer quality. We’ve searched high and low only to find the solution is to produce the good stuff ourselves. One thing I recall about a 62 strat was the quality of the neck plate. It was thick, it didn’t bend. low cost import plates, 0.5mm thicker than repro plates ( including a highly regarded Callaham plate) . We think it is the best neck plate available for your guitar today. Its only screws, so whats the big deal? Ideally the neck needs to be under compression, a good squeeze from the sides of the neck pocket aswell as being pulled down, by the screws, onto the body nice and tight. You also want to be confident the screw threads in the maple will enable the screws to keep doing this, after being un-screwed, screwed for set ups, truss rod adjustments. The picture above shows on the right a commonly available import screw. Sure it will hold the neck onto the body, but at just 4.00 mm wide (including threads) with a 3mm hole drilled in the neck, only .5 mm of thread actually grips the Maple, plus the machined quality of the threads is, from our experience very inconsistent. Furthermore, the screw only extends 11mm above the neck pocket, which is only 6 threads into the Maple. Basically, this means you have to go very careful and you can’t exert much pull force on the neck without stripping the threads. Furthermore, each time the neck is taken off ( eg to adjust the trus rod) the threads will wear, weaken and eventually fail. The screw in the middle is a modern Fender screw, it is better at 4.15 mm width, plus has nicer cut threads, but it is still only 10mm (5 threads) cutting into the maple. The screw on the left is our Wudtone screw. It is made of hard stainless steel and is wider at 4.7 mm including the thread (would you believe this is the old fashioned 3/16 ). It has precisely machined threads and so with a 3.5mm hole it has .6mm of thread width cutting into the maple, it also has 9 threads gripping, thats more than half as many again, wider, more accurately machined threads able to exert pull on the neck. 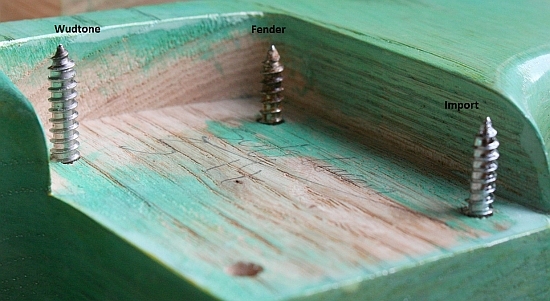 The thickness of maple underneath a fingerboard is usually 20-22 mm our screws extend 17mm above the neck pocket. So we believe that is just right. In simple terms import / fender screws only penetrate halfway into the available maple, our screws 2/3 for the best joint. The pic on the right shows the difference in penetration. The Wudtone screws result in a far stronger joint which can enable the neck to be pulled with more compression onto the body. Furthermore, you can be confident it will continue to do this effectively after many many neck on/offs for set ups. •Neck pocket holes in the body- Drill 3/16 imperial dia, ( 4.7mm) in the body. •Neck holes – Drill 3.00mm dia , 17mm into neck, then drill with 3.5 mm dia into same holes, only 14mm into neck. When fitting screws for the first time, make sure you have a screw driver than is the correct fit for the screws, scrape a little candle wax onto threads at the end of the screw. Hold the body, neck up, with the bottom edge against you and your left hand clasping the neck onto the neck pocket. Apply some pressure whilst turning the screws to help the threads cut into the maple cleanly, only a couple of turns to start with ( it may squeak and the screw will get warm). Release the pressure and unscrew, add a little more candle wax to the threads a the end of the screw. Screw in again and then cut another couple of threads, repeat until screw is nearly pulled all the way in. Repeat with each screw and then tension each screw 1/4 of a turn at a time, (do opposite diagonals) until the neck is pulled nice and tight. 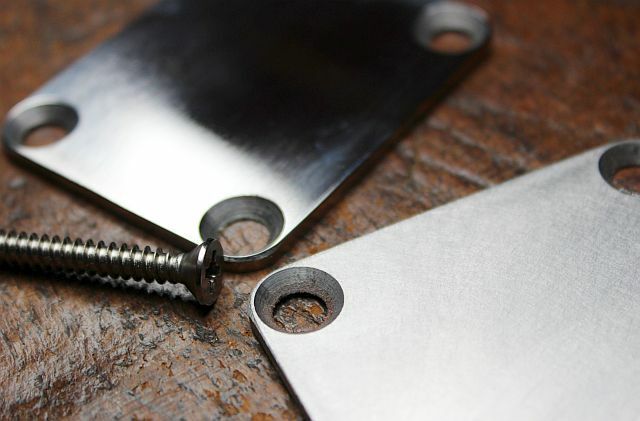 Wudtone Neck Plate and Screws now available in our online shop here.